Illuminate her wrist with the lavish look of this gleaming 4.00 ct. t.w. 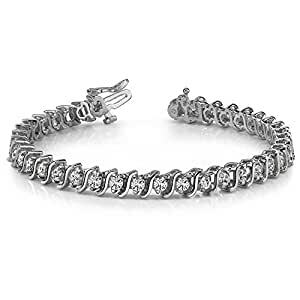 diamond tennis bracelet. A row of round miracle diamond accents radiate optimal shimmer. Uniquely designed, each miracle diamond is set to appear extra large and more brilliant, creating twice the sparkle. Held together with a claw clasp, this 7-inch bracelet is a chic mix of glamour and elegance. This item is only available online.